I profiled Martha Putney, one of the first African-American women to serve in the Women’s Army Corps (WAC) during World War II, in a podcast for #HerStory. 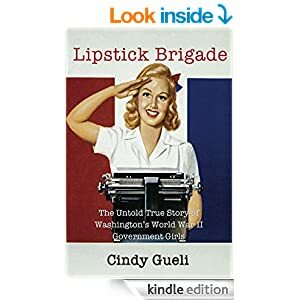 Putney appears in Lipstick Brigade, and I was impressed with her perseverance, accomplishments, and strength. The #HerStory project is the brainchild of Rebecca Price, who invited 50 contemporary women to each tell the story of a woman from history that she admires. These podcasts were presented under the non-profit Chick History (check out their Facebook page for some terrific articles: https://www.facebook.com/chickhistory). After earning a master’s degree in history from Howard University in 1940, Martha Settle Putney hoped to find a teaching job in D.C.’s public school system. When she couldn’t, Putney took a position as a statistical clerk with the government’s War Manpower Commission. She hated it. She faced racism from both colleagues and the federal system. Looking for better opportunities, she joined the Army. Major (later Lieutenant Colonel) Charity Adams inspects a battalion of African-American WACs in 1945. Putney used these experiences to write her book, When the Nation Was in Need: Blacks in the Women’s Army Corps During World War II. It was one of several pioneering works of history she wrote before her death at 92. Her academic and personal reputation lead to her being included in Tom Brokaw’s influential The Greatest Generation. Listen to the podcast for more on Putney’s inspiring life story. Or you can pay your respects at Arlington National Cemetery, where she was laid to rest in February 2009.